I was in Toronto on a business trip this week and unable to full participate in the School Committee meeting. I did manage to tap into the web cast after the school budget discussion and near the beginning of the School Start Times discussion. While the cable broadcast did cut out at 10:00 PM, the webcast did not. I did tune out at the end of the start times discussion approx 10:15 PM and miss the remaining of the meeting agenda. We'll all need to catch up to the Franklin TV rebroadcast when it is available. Programs and positions amounting to $2.3 million were found to reduce the budget deficit. The details are listed in the links below. The budget is scheduled for vote by the School Committee at their Apr 23 meeting. The school budget is scheduled for review and discussion at the Finance Committee meeting Apr 25. The Finance Committee is also scheduled for a vote that night on the full Franklin budget to send to the Town Council. The Town Council has their two budget hearings scheduled for May 22 and 23. 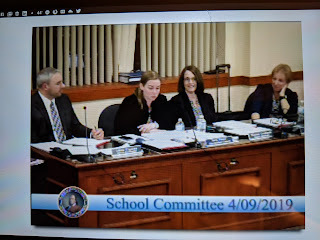 The Council meeting of May 8 is scheduled to be a discussion and update from our State legislation delegation (Representative Roy and Senators Rausch and Spilka). Time is getting short for scheduling an override vote to occur before the July 1 FY 2020 budget year begins. Without an override vote scheduled, this means the school budget will need to absorb the $2.3 million identified (or something similar that amounts to the same total). It also means that the school budget which was originally proposed to meet critical needs (and acknowledged to not meet them all) will certainly increase the critical needs NOT being meet for our future generation. A number of folks stepped forward to comment for and against the school start time proposal. It was good to see so many showing up in person. Where were you all the past year? I hope you show as much engagement around the school budget (no matter what side you choose). The Superintendent's proposal to formally close the Advisory Committee (a normal and expected action) along with the proposal to continue to work on the details for implementation is expected to be voted on at the Apr 23 meeting. The vote on a school start times proposal itself would not be until sometime later this year at the earliest.